Courtesy of Tattoo Archive: Has anyone else noticed that the large bottles (33.82 oz) of black Pelikan Ink have disappeared from store shelves and tattoo supply catalogs? 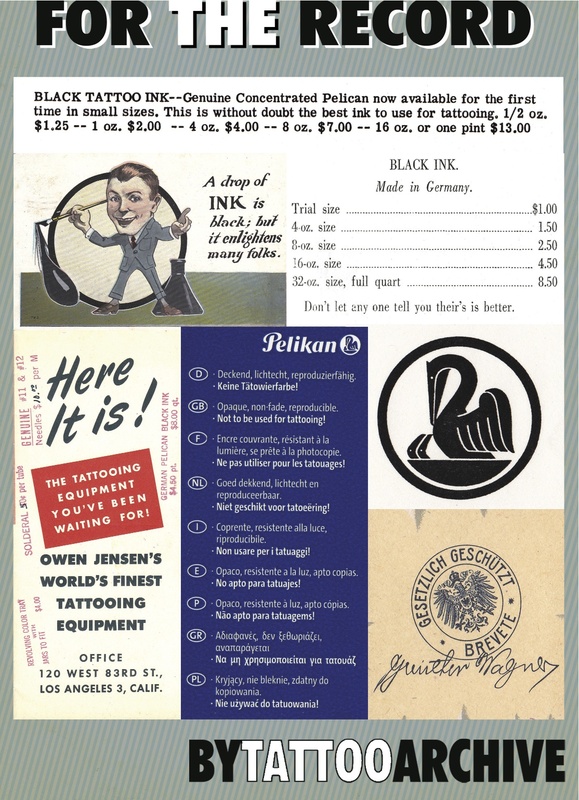 For several years the famous German ink makers have put labels on their large bottles of Noir Black ink warning, in nine languages, that their product was “Not to be used for tattooing”. I am almost certain that this had little effect in the tattoo business. You must remember that for at least one hundred years Pelikan Ink was the standard for the tattoo industry. Tattooists and tattoo suppliers alike would brag that they used the very finest German black ink, which was shorthand for Pelikan Ink... The Pelikan website gives a wealth of information about this company stating its history goes back to 1838 when chemist Carl Hornermann founded his own color and ink factory. Originally he cooked and pressed the ink in a farmyard 20 miles from Hanover, Germany, but in 1842 he purchased property in the Hainholz section of Hanover. In 1863 Gunther Wagner became the head chemist and plant manger and he took over the plant in 1871. Wagner’s family emblem was the pelican and it became the company’s logo in 1878. In fact, it was one of the first German trademarks issued. The company grew and grew adding other office products for copying, stamping, sticking and erasing. In 1895 one of the company’s long time employees Fritz Beindorff, married Gunther Wagner oldest daughter and took over control of the company. 1896 was a monumental year for the Pelikan Company because that year they started producing Indian or India ink. This is the carbon-based black ink that has been used in the tattoo business for many years. Perhaps this should have been called China Ink, as there are many who think that India ink was first invented in China. You might notice that on some of the images with this article Pelikan is spelled Pelican. I don’t know why this would be other than the Americanization of the German spelling of Pelikan. Tattoo Archive © 2010 This installment of For the Record was in Tattoo Artist Magazine issue #24.